Cafe Maude is rather odd. It's a hot spot in a sleepy southwest Minneapolis neighborhood that, before Maude opened, had never seen so much nighttime activity or so many parked cars, something that drives the adjacent hardware store crazy. It's a restaurant where a grilled flat bread is a meal (try the smoked chicken), a hamburger is heaven, and a sister special-events venue across the street, the Armatage Room, serves prix-fixe dinners based on themes: Istanbul, Argentina, period Italian films. On the weekends, it's a mostly-jazz music club that books some of the best musicians in the Twin Cities, but almost no one comes to listen. For the vast majority of people standing two or three deep around the bar and chattering in the booths and at the tables, the music is aural wallpaper. And yet, how I love Maude. I make sure to know who's playing there, and I often end up going, usually a bit later into the evening, when some of the clamoring crowd has cleared. A quick list of just some of the people/groups who have appeared on the small stage in recent months: Chris Thomson, Adam Linz, Dave King, James Buckley, Bryan Nichols, Jay Epstein, Anthony Cox, JT Bates, Chris Bates, Alden Ikeda, Michael Lewis, Patrick Harison, Fat Kid Wednesdays, Enormous Quartet, Martin Dosh, Dean Granros, Milo Fine, Davu Seru, the Pines, Brad Bellows, Peter Schimke, Park Evans, Volcano Insurance, Joey Van Phillips, Tim Glenn, Sean Carey, Paul Metzger. Last night it was a group billed as the Peter Schimke Collaboration. 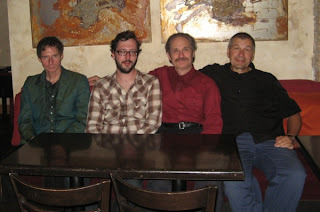 Led by pianist, composer, and sometime singer Schimke, it included Dean Granros on electric guitar, James Buckley on acoustic bass, and Jay Epstein on drums. Accordionist Patrick Harison stopped by after an earlier gig at a church and sat in for a couple of tunes. We had requested a table near the music and got one. Don Berryman of Jazz Police joined us, having come over from the Artists' Quarter in St. Paul, where Astral Project was playing a second night. (HH and I came from the Bloomington Center for the Arts and a Johnny Mercer tribute show; more about Astral Project and Mercer later.) We heard the whole second set. When it was over, I was completely satisfied. I would not have changed a single thing or asked for one thing more. —Monk's "Trinkle Trinkle." This group can really play Monk. —"The Vow," an original ballad by Schimke. So beautiful. —"Wrong" by Jerry Bergonzi. Complex and challenging. —Steely Dan's "Do It Again." Schimke sang ("You go back, Jack, do it again/Wheel turning round and round"), Harison played the squeezebox. —"Blue Sparrow" by Dean Granros. —Wayne Shorter's "Footprints," their closing number, a joyous, freewheeling, in-the-moment journey through a jazz standard with generous solos by everyone. What else is there, what else could there be? Check Maude's calendar to see what's coming up. No cover charge, no reservations needed after 10 pm. Music starts at 9 and goes until midnight, often later, as "Footprints" did last night. The band just kept playing, as if they didn't want to let go of the tune. The only caveat: You have to be able to stand the crowd noise. If you can't, you'll get cranky and start shooshing people, who will look at you as if you're mad and then ignore you. If you're not sure, think about this: Month after month, weekend after weekend, exceptional musicians come to Maude to play. There's something about the place. Maybe it's owner Kevin Sheehy's infectious passion and enthusiasm for the arts. (Talk to him about art or travel or a particular musician or food and he's like a pot boiling over.) Or music programmer Ms. Mysterious (she doesn't want her name in print), who knows what she likes and brings it in. Some musicians feel she's too exclusionary; I say keep up the good work, Ms. M. Maybe it's the room; comfy, cozy, well-appointed. And the full bar, and the eclectic menu, and (in clement Minnesota months) the patio. Or maybe it's all of those things. Who knows. I'll be back. Photo of the boys in the band by Don Berryman, taken after last night's final set. L to R: Schimke, Buckley, Epstein, Granros. Hi Pamela, Nice rendering of the atmosphere!